The Sheridan: Four Level Boutique Style Building. Very private building with 10 residential units and a cafe downstairs. 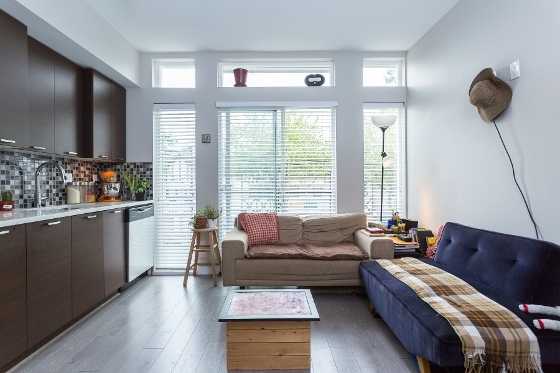 Located in a great location with easy access to downtown Vancouver & community activities. Features include a 25 sqft patio, in-suite laundry, lots of storage, secured bike area, eco friendly energy efficient windows, stainless steel appliances, nine foot ceilings, and an outside courtyard. Located near the center of the city, public transit, restaurants/lounges, bakeries, coffee shops, grocery stores, schools, Riley Park Community Center & Queen Elizabeth Park with its Pitch and Putt Golf courses and much more. For a private viewing contact Carmen Leal at 604-218-4846.